Experiencing the most beautiful parts of the world on foot as part of a walking or hiking holiday is surely one of life’s greatest pleasures. What’s more, it provides a healthy dose of exercise to nourish the body as well as the soul. If you have yet to discover the delights of discovering those off-the-beaten-track corners of the world, we would urge you to give it a try as, once tasted, it can prove to be a life-long and treasured addiction. There’s no special equipment required but investing in a pair of good quality walking boots and suitable all-weather clothing will repay dividends. Walking all day can be tough on the feet, especially if you are unused to this degree of exercise, so well-made boots, with all the right areas of support and rugged soles can spare you blisters and keep your feet warm, dry and comfortable throughout your journey. You’ll need to be prepared for all types of weather from blazing sun to raging blizzards, so carrying the right type of clothing for every eventuality is essential. This is especially so if you a walking in mountains where the weather can change dramatically in a matter of minutes. Fortunately modern technology has produced sophisticated lightweight clothing which is ideal for walkers to carry in a rucksack to pull out or stow away as the weather dictates. Whether you chose to walk by yourself or as part of a walking group, you need to have the right hiking insurance in place to give you peace of mind and to cover any mishaps along the way. Hiking is often undertaken in remote areas where medical or other assistance is not always close at hand. What could be a minor complication in normal circumstances, such as a sprained ankle or fractured bone, could necessitate a helicopter rescue if such an accident occurs in mountainous or distant terrain. Add the costs of any hospital treatment or if repatriation to the UK is medically necessary, makes it essential that you have suitable insurance to cover all of these eventualities. The Standard Pack covers you for walking , hiking or trekking up to 2,500 metres or 8,200 feet. For British people this is serious mountain altitude as our highest peak, Ben Nevis, is just 1,344 metres. 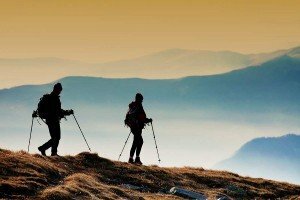 Up to 2,500 metres will include the majority of serious walking trails most walkers are likely to undertake. If you wish to go even higher, then our Extreme Activity Pack covers any altitude above 4,500 metres, and is suited to the most challenging of mountain treks such as Mt Kilimanjaro, Aconcagua and Mont Blanc. Included in all the Policies, The Standard Pack covers you for walking , hiking or trekking up to 2,500 metres*. This is serious mountain altitude as our highest peak, Ben Nevis, is just 1,344 metres up . But if you want to go higher, then our Activity Pack covers you up to 4,500 metres*, which would just include reaching the peak of the Matterhorn at 4,478 metres or the highest part of the Inca Trail to Machu Picchu at 4,430 metres. Our Extreme Activity Pack covers above 4,500 metres*, with no upper altitude limit and is suited to the most challenging of mountain treks such as Mt Kilimanjaro and Mont Blanc.